Thank u -- i did read the links but i'm just reconfirming what i understand. In the old days, before people had plumbing, it was the custom to take a hot bath outdoors in a portable tub and pour the water on the ground. Most folks bathe indoors now, but still, many of us like to carry a small symbolic cup of water outdoors and dispose of it, usually at a crossroads or toward the rising Sun. The candles can be any length, from birthday candles to Jumbos, but the most common size is the 4" altar light size. The candles, when burnt out, and any left-over incense ash, may also be taken to a crossroads for disposal. Is it necessary to do a separate spiritual cleansing bath following a 13 herb bath for uncrossing and jinxing? In looking at curios listed in HHRM for cleansing/purifying and uncrossing/breaking jinxs, I see several of the same herbs that may be used in both. I want to use my LMCC 13 herb bath and follow with a house cleansing of Chinese Wash but am questioning the addition of bath water to the wash. Both type baths would have "bad" stuff (from me) in the disposal water yet they are both considered a "spiritual" cleansing. Just wondering if doing a general bath with specific cleansing and purifying curios to rid of all negative conditions and save the 13 herb one for that condition alone. This is one of those many things when the more I ponder it, the more confusing it gets and then I finally have to eat crow and ask. You can safely include some of your bath water from the 13 herb bath (as well as 13 herb bath itself) in the Chinese wash-water you use to clean out your space. 13-herb bath is a versatile mix, suitable for both heavy-duty personal spiritual cleansing and inclusion in wash water for house cleaning (along with Chinese Wash). Often, cleansing spiritual work has 2 phases: First, remove any jinxes or obstacles to cure by cleaning one's self and one's space thoroughly (washing oneself down from head to toes with 13 herb bath, washing the house top to bottom and back to front with Chinese Wash) and then, once that has been done, do work to draw in what is desired (peaceful home, money, love, protection, etc. ), often with a second bath (washing oneself upwards from feet to head with peaceful home herb mix, love herb mix, Protection bath crystals, etc) and washing one's space a second time (front to back with a fresh bucket a water with Peace Water, Cinnamon, sugar, Firrey Wall of Protection bath crystals, etc.). The processes are mechanically similar, but differ in direction, ingredients, and purpose. I just wanted to ask if u have youngsters u were washing with the 13th herb bath or a sick person how would u do that on there bed etc..and how would u collect the water to throw at crossroads..would they throw it or u...and can u collect everyones bath water together to throw it in one heap at the end.? Would if really matter if the water wasnt thrown at crossroads and just went down the drain instead? If I was washing a bedridden person or child, I would collect some of the water in a bottle and throw it out the window of a busy four way intersection far from where the person lives. If I am administering the bath, I get rid of the water for the client. If you are doing a large group at a time, you can through it all out in one heap. It is an important step though. I have received my packet of 13 Herb bath.Instead of the Psalms, though nicely written, I would prefer to use another recital. Would it be less powerful? Any other suggestions as to what to recite? Also, would it be okay to also scrub down with Kosher Salt before I immerse my head 13 x's? Washing should be downwards from what I understand. How long should I take with this ritual? At least 30 minutes? I was recently in a bad car accident....now in a borrowed vehicle.....Can I spray the inside and outside of the car I will be driving? I know I can order something on that from LM. In the meantime, any good protection for now? I understand from the reading from the site the rest of the instructions. Most questions are answered right here in this forum. Re: Psalms: I pass along the tradition as i learned it, but i do not teach people how to pray. Re: "Power": Many factors go into a spell's success or failure. Prayer is one factor. Re: Salt Scrub: It's not particularly traditional. I can't help you much with methodologies that are outside the African American and Southern American conjure traditions. The way we do it is, if you want salt in the bath, you would dissolve a half-handful of salt in the bath water. Re: Washing downwrd: That is correct. Re: Number of repetitions: This is up to you. Most common numbers in the hoodoo tradition are 3, 7, 9, 13, or 21 repetitions. Re: Spraying entire house, spraying car: Just do the rooms you rent and occupy, and the car; incensing the shared living room is a good idea, if you can do it. hello lm friends. if anyone out there has a heart to help me & who may be able to identify with my case then pls offer your assistance. i have almost a week left to complete my 13 herb bath in the uncrossing spell. this night as i prayed for my hard times to end & my psalms something happened to me that my gut tells me is not just an effect of the 13 herb bath. i wrote my prayer for hard times to end on the wall friends. when i got to the last 2 pages, i began to feel light headed, dehydrated, naseous & short of breath. i felt as though i was gonna faint. i didnt know what was going on but i kept reading the best i could. it then got stronger & began to sweat profusely. the next thing i know, my vision began blury, I COULD NO LONGER SEE THE WORDS ON THE PRAYER PAPER OR ANYTHING & i had no more strength, & couldnt even speak. my only thoughts were that i was going to fall out & die in the tub with no one knowing but God. i dont know how long i was out, but i was leaning against the wall desperately praying on the inside for my vision to finish the prayer so i could fifnish the work. even though my eyes were open & i was opening htme harder, there was still no vision. i kept trying & trying to have sight & slowly i was able to see the words on the paper. i felt something on my foot & i thought it was a towel or something. but it was one of the 2 prayer papers in the water. i picked it up & began to finish the prayer for my hard times to end. as i got out the tub i began praising God for my life & delivering me from whatever just happened. i also prayed against whatever evil that was trying to over take me & my boyfriend. today my boyfriend told me that for 3 days now he has been having a stomach ache. he said that he could only eat 1 meal a day & that if he ate more his stomach would hurt bad? that is unusual & i dont udnerstand. also, very recently my boyfroend's family has become aware of the woman against me's wicked ways. they are beginning to talk & have professed that they do not like her & have said that she has a demonic spirit within her. i was happy to learn of this because part of my prayer has been that she is exposed & found out! my beau is still blind to the fact about this woman & does not believe the warnings he has received by his family about her. i am still praying for him. friends, waht do you think is happening? does this seem normal to you during this bath? does it sound like my enemy is working harder against me in which i think she is? if so, does this mean my attempts are in vain to finish the bath? i plan to do a fiery wall protection after my 13 days are up. im concerned that this will not be enough. it seems that i need either more help, people on my side to work against/pray against this evil or more work of some sort?? also, my beau's aunt & i prayed for him & against my enemies for the first time tonight. could this be a reason i experienced what i did in the bath? is this a sign not to pray with my beau's aunt anymore? i feel a little beter but still very light headed. Keep up with the uncrossing...it's not going to hurt you. I also recommend getting a divination/reading from one of these fine workers at LM for your situation. I am doing the Uncrossing 13 Herb Bath and it says to repeat the 37th psalm 13 times for each time you go under water, however, on the packet it has a small sample of the psalm. Is it okay to read that or must we read the entire Psalm 37? The sample is simply to help folks who know the Psalms to remember which one. You are definitely to recite the entire Psalm. 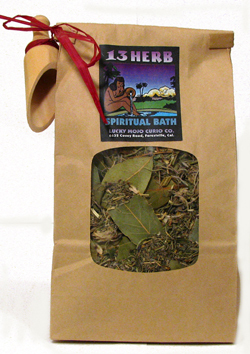 If I were to use the 13 Herb Bath for thirteen days, would I make a wash every day? On the first? The last? every day for 13 days, starting on the first day and ending on the 13th day. I just realized I wasn't very clear in my question. I meant using my bath water as a floor wash.
Would it still be the same? Is the 13 herb bath more effective or stronger than the uncrossing kit? Which is better or let me say the most effective. I have ordered the uncrossing kit and I need to help someone get rid of a bad spell. I need something strong. also when doing any of the two of these baths do you just let the water go down the drain or do you have to dump it outside? The 13 herb bath is neither more nor less "effective" or "strong" than the Uncrossing kit. They may be considered complimentary in their use, and best suited for slightly different applications, respectively. The 13 herb bath (which, it should be noted, is included in the uncrossing spell kit) is an excellent bath to use for the purpose of removing crossed conditions, obstacles to cure, stagnant, negative energy, and mental / emotional fog and confusion. Uncrossing bath crystals may be used in a similar manner, although some may feel that 13 herb bath may be appropriate to a wider variety of cases. The strength of the Uncrossing kit lies in the multi-faceted working that it supports: bathing, candle-work, cleansing of one's home, creation of a protective mojo, and detailed instructions for use of all of the kit components. That said, both 13 herb and Uncrossing bath crystals types of bath are most often done before sunrise, and will be applied downwards over the person the being bathed. After the bath, one will exit the bath between 2 white candles, and allow oneself to air dry. At least a portion of the bath water will be taken out to the nearest crossroads for disposal (over the left shoulder toward the rising sun, walk home a different way from which you came, and don't look back). For the 13 herb bath, the pkg and LM's Herb website says to recite Psalm 37 each time you pour water over your head however LM's uncrossing website says to recite psalm 37 each day 13 days in a row (equates to 13). In other words, do I pour the bath water over my head 13 times, Read Psalm 37 each time; or, read Psalm 37, and pour bath water over head 13 times for 13 days. The latter -- 13 recitations of Psalms, 13 lots of pouring, 13 days. I would like advice on how often to take the herb baths...13 herb, 9 herb and 7 herb...is it advisable once a month, twice a year etc...I understand the importance of taking them periodically...but I would like advice on this question...Thanks. In all of these cases, the type of bath and the frequency is determined by the kinds of things that the person is doing in his or her life, as well as his or her susceptibility to environmental / social factors. Excuse me if this has been asked before. Normally I do a weekly 13 Herb Bath for removing any crossed conditions. I also do a Hyssop bath for cleansing. I guess I may be asking something that I shouldn't...is hyssop one of the ingredients in the 13 herb bath so I could just do the 13 Herb bath solo. It may or may not be, but that's not really the point. 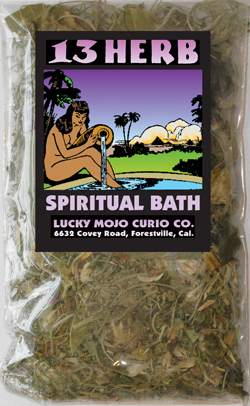 A Hyssop bath is for certain things, and a Thirteen Herb bath is for different things, even if Hyssop is a component in LuckyMojo's bath, and i don't think LuckyMojo will tell you, it will not do the same thing a Hyssop bath will. Conversely a Hyssop bath will not do the same thing a Thirteen Herb bath will. Thank you Hail...I decided to do both...to cover all areas. I am still enjoying my baths. The way I understand it is that 13 herb bath is for crossed conditions that originate externally and hyssop bath is primarily for those that originate internally. If you think the condition you are trying to change comes from outside yourself, use 13 herb. If you think it is comes from your own thoughts, feelings, actions, use hyssop. Personally, I use hyssop, but may try 13 herb. Using both is a good idea if you want to be thorough. You hit it dead on Mama Micki. Thanks for the additional insight. I want to start the 13 herb bath tomorrow, should I take a traditional bath with it or do I just pour it over my head 13 times and recite the psalms? As for cleansing your home, are you supposed to use the left over bath water? The 13 herb bath has hyssop, and it takes care of all bad spiritual energy. Both internal and external, you do not need to get both, but you can if you feel better. Does anyone know of you have to read ALL of psalms 37? Reason why I am asking is because I want to do both 37 and 51. And they are both long. I plan on cleansing my condo with the left over bath water, should I let some go down the drain if I dont need it all? Or should I make a bath that is not so diluted so I can use all of it so then I can throw it outside after the condo cleansing? Please any information would be very appreciated. I tried my first bath out of 13 and I was not totally prepared. thanks. It is tradition that you read the entire psalm 13 times. I have read 37 and 51 at the same time... when taking both baths. Disposal is symbolical...that is why you take a portion of your bath water and disposal at crossroads for 13 Herb and Hyssop baths respectfully. is there a way to know if you really need 13 days of the herbal bath? Is there a divination I can do at home with everyday items to find out? Sure, if you know how to divine. Pendulums or cards, whatever you know and have the gift for, ca tell you, so can throwing the bones or shells. It sounds like you do not have a form of divination that you are gifted at, so I would recommend getting a reading from someone at the AIRR, if I recall correctly Miss Cat will answer a yes/no question for a small fee. If someone was to start a 13 herb bath with intention to complete the ritual on the 13th day, but for whatever reason stop on the 5th should that person start over and can the person start over? I havent done it for 2 days and I want to start over can I still use my 2 offeratory candles that have been dressed properly? I never blew them out just pinched them. I am doing the 13 herb bath for 13 days with candles dressed with uncrossing oil and uncrossing incense. Now, I want to do a bath once every week or two afterwards. I have a talisman all ready and blessed by a kabalah rabbi for protection. So I was wondering when I do my periodic baths after my 13 days cleansing ritual, can I still use white offeratory candles after the bath to stand between? And what kind of oil, incense should I use with the candles? And do I need to recite any psalms for periodic baths? I was thinking reciting psalms 23 or 116 or 121, and using blessing oil and incense with the candles afterwards. I do not think uncrossing oil and incense is needed for periodic baths when your already purified and have protection and you just want to get a cleansing, blessing sounds better but I am not the professional and I wont until I learn. And I plan on soaking all the info on hoodoo I can so I can be a professional. • After I steep the herbs in the boiling water, can I pour the the liquid into the "entire tub of water" OR "do I have to pour them in a bucket (or big container)" and "only to be used to pour over myself?" but not to take a regular bath with it? • Can I add Sea Salt and powdered Cascarilla as well? If so, is it better to spray them w/ the 'used' 13 Herb Bath water instead? • Should I air dry myself after the bath? You can also put the herbs in a muslin bag (LM sells the bags and they are reusable) and put it in the bath or steep it in hot water. Less mess and easier to properly dispose of the herbs when you are done. I wouldn't add anything else, as you're upsetting the significance of the number '13' in the ingredients. It's not meant as a bath to soak in, if I'm not mistaken.. It would be best if you pour the bath (13 times) over your head, as you want to draw the negative influences away from you, from your head down off your toes. You wouldn't want to soak in a bath filled with bad juju, would you? And definitely air dry yourself, don't towel yourself off. I think it's specifically mentioned in the instructions of the 13 herb bath? As you recite the prayer each time, do I say it 'right before' I pour the water over me each time? Because when you're pouring them over you, there is no way you can finish saying the entire prayer.. I pour my herbs thorough a strainer into a bathtub, sit in it, pour and pray each time. You can stand in a large flat bottom bowl (plastic basin) or bucket as you pour the bath over yourself (especially if you do not have an actual bathtub but only a shower stall). Make sure the basin is large enough for you to stand in comfortably and make sure the bottom of your shower stall has a no-slip surface. I just ordered my 13 herb bath i will be recieving it in couple of days.I hear you have to dispose the water at crossroads.My question is how many times do you have to do this? do you do it the first time or every day until you are done, also is it best to take the bath in the early hours of the morning or at night? The instructions shown here http://www.herb-magic.com/13herb-bath-one.html states 13 baths, dispose at crossroads each time (13 times) everyday until you have completed the bath 13 times...at sunrise. When your receive the bath it states it on the package. I started the bath and cleansing my home and followed by reading psalm 37, from the 7th on Nov 09 to 20th Nov (for 13 days)..... At 12am, I would throw the bath water at the entrance of my building (my neighbours a nicer now) and also throw a cup of bath water towards the east. To make the story short, the doctors were suprised that I was not bedridden. At this rate I could die within 2 years or sooner or even if i had a minor accident and had broken the smallest bone in my body, I could bleed to death and die before help could arrive... they ran all the tests. For the 1st time in my life i was hospitalized (3 days) and I had 4 pints of blood transfusion. My health was improving and doctor were hopeful with my evaluation.. Anyway I have to go back again in 2 weeks for another test. the point that I am making it that the 13 herbal ritual has cleared / is still clearing, all my obstacles. All my life my enemies have been attacking me with magic, and I was getting weaker within my body and i was unaware of it. (like the doctors said, i could have died if i had been oblivious to my health). the most miraculous part is that I was lead to the hospital for one treatment but I was diagnosed for another maladie. the 13herbal bath has lifted my blockages, and is leading me to find help, cure and treatment to have a healthy and a long life. I happily walked out of the hospital and I am looking forward to go back again to be treated for my diagnosis... My 13 herbs will be an every month ritual. Glad you had such a good experience. I also love the 13-Herb Bath, and it helped clear away alot of mess in a very difficult time in my life as well!